One of many participants in the procession. 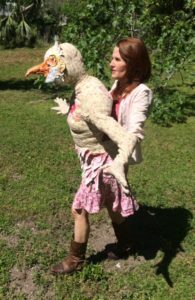 The Soft Sculpture and 3D Foundations classes, led by Linda Hall, will participate in a parade this Saturday, April 15th, 2017 at the Wakulla Springs Wildlife Festival. Please join the Procession of Extinct, Rare and Whimsical Animals at 1:00PM. Among the cast will be a mastodon, a dire wolf and a Carolina parakeet, among others. For more information, please contact Linda Hall at goosehall@gmail.com.